Gas giants play a crucial role in how much water accumulates on new terrestrial planets. NASA haslong followed the water and chemical building blocks of life in the course ofspace exploration. But most computer simulations that help scientistsunderstand how planetary systems form usually overlooked the chemistry of planets,at least until now. A new studyhas looked for the first time at the dynamics and chemistry of how Earth-likeplanets form. The approach shows how rocky planets form from the manicswirl of gas and dust in the early planetary systems, and also what chemicalbuilding blocks existed in the planets that emerged from the chaos. "Ifwe're looking for Earth-like planets, it'd be nice to know the chemistry we'reafter," said Jade Bond, a planetary scientist at the University of Arizonain Tucson and a lead author on the study. Such a first step has only assessed the chemistry of Earth'ssolar system, and still needs testing across more dynamical models. Buteventually Bond and her colleagues hope to also assess the chemistry ofexoplanets in orbit around other stars. Dynamicalmodels usually focus on the physics of interactions that lead to the formationof such rocky planets, and don't examine the chemistry that ends up in planets.At best, some have simulated how meteorites might carry water to planets. Bond'sgroup wanted to see if dynamical models could also successfully predict thechemical building blocks that make up planets similar to those in Earth's solarsystem. Toward that end, they used commercial software to analyze the elementsthat make up the planets, using a 2006 dynamical model by David O'Brien at thePlanetary Science Institute in Tucson, Arizona, and colleagues. Thesoftware figured out the starting chemistry of different planets by calculatingequilibrium condensation temperatures within the primordial cloud of gas anddust that eventually formed the solar system. Scientists have found thatcertain temperature profiles reliably match certain chemical profiles, afterstudying material from meteorites that fell to Earth. Some meteorites stillhold the chemical profiles of the early solar system, and can serve as usefulreal life comparisons for simulations. Model resultsshowed that Earth and other rocky planets in the solar system formed "wet,"with perhaps enough water tosustain life. But important elements such as nitrogen and carbon did not accumulateduring simulated planet formation, which suggests that they needed to arrive byother means to kick start the development of life on Earth. Gas giantssuch as Jupiter and Saturn appeared to influence how much water materialaccumulated on terrestrial planets. 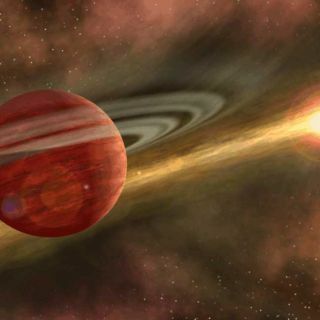 But gas giant evolution had less effect onthe elements that form the rocky layers of such smaller planets, at least afterthe gas giants had themselves formed and moved out to their current orbits. Such earlyfindings seem promising. But the researchers want to extend their chemicalanalysis across more dynamical models before they feel comfortable aboutdrawing conclusions about exactly how Earth's solar system formed. "Basicallywe're trying to get a better sense of how terrestrialplanets form, and the processes that we can expect to see," Bondexplained. "And we're not only focused on our solar system, but otherplanetary systems as well." Bond wantsto include many more factors that play a role in how an Earth-like planet'schemical equilibrium takes shape, such as giant planet migrations in the samestar system. But she knows that even today's supercomputers have their limits,and so do models that try to simulate how real planets formed. "Toessentially get every aspect of this, get all the dynamics going, track everysingle particle and every outflow from every collision, adding in chemistry,crossing the ice lines ? the computational power is just ridiculous for that,"Bond said. Still, theresearchers have begun chemically profiling known exoplanet systems with thecurrent simulations. Knowing if many rocky planets form with the proper balanceof water and other chemical compounds would go a long way toward understandingwhether conditions suitable for life are widespread or not. Bettermodels could even help focus the search for Earth-like planets by NASA'sKepler Space Telescope and other missions, once chemical profiles for suchpromising terrestrial planets have become firmly established. But scientificcertainty may only come when the researchers can verify their chemical profilesof planets in other dynamical models. Moredetails on the research appear in the August/September issue of the journal Icarus.